Starting with our waterfront boat house complex, nothing on the bayou comes close. Our dock facility is a completely roofed in 5 lift boat house complete with custom fish cleaning stations and individual boat lifts so stepping onboard with your captain is always just a simple step. No matter how high or low the tide, we can get our boats level with the dock to make ease of loading and unloading catch, gear and person as easy as possible. The dock is always a popular area before and after the trip to hang out, mingle with captains and crew, and even observe or take part in cleaning your days catch! Having such a large dock is unparalleled in accommodating large groups, as we can literally board five boats worth of anglers at a time, all under one roof. The Pelicans Roost Resort can accommodate up to 12 people on the houseboat, and even more in our sportsman cabins directly across the street. The additional cabins only a short walk away can accommodate another 25 guests. The all-inclusive experience is not limited to only the available 12 beds within the houseboat as we offer the experience to all guests staying at the lodge. 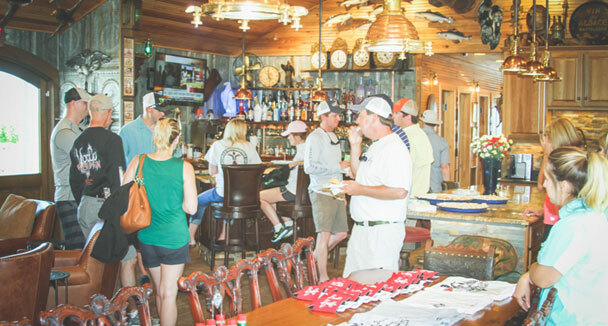 The capability to house so many people makes Louisiana Fishing Charters a perfect solution for large company trips, retreats, or even family gatherings. As for lodging large groups, we have that covered as well. We are the only facility of its kind in Delacroix Louisiana to include a large resort style houseboat known as the Pelicans Roost Lodge. This lodge was constructed with no limitations and is absolutely breathtaking inside. You will find inside a beautiful collection of coastal Louisiana and New Orleans antiques and artifacts that rival some museums. 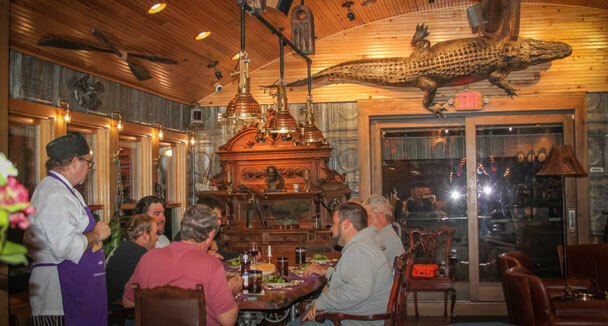 Beautiful mounts of local waterfowl, alligators and of course prized sportfish are well represented all within the lodge. In addition to its beautiful décor, a full professional commercial kitchen is in place, however you will not have to lift a finger to enjoy delicious traditional Louisiana cuisine. Our local five star chef is on hand to treat all-inclusive guests with an incredible three meal a day experience, including the days catch following your trip! Snacks and refreshments are of course available to fill the gaps between meals if one desires as well. Not only will all-inclusive guests be treated to incredible cooking, a fully stocked premium open bar is just a few paces away from the kitchen to boot. Our on staff bar tenders can mix you up anything you desire, including some New Orleans classics like the esteemed Vieux Carre. For those who prefer offerings other than spirits, we also have an extensive selection of beer and wines for your enjoyment. The old luxury feel meshes with modern technology as we have large flat screen tv’s throughout the entertainment area as well as hi speed wifi to boot. This large meeting area is perfect for simply kicking back with friends after a day of exciting inshore fishing, watching the game, or even conducting a company meeting. Two large porch areas grace the outside of the Pelicans Roost lodge and provide an excellent area to enjoy the bayous charm as you enjoy a meal, have a drink, and perhaps even a cigar. FISHING TRIPS OF A LIFETIME….EVERYDAY! Your all-inclusive stay with Louisiana Fishing Charters will include lodging, first class hospitality, authentic New Orleans cuisine, a phenomenal fishing experience with first class guides and gear, as well as all the southern charm one would come to expect. Your included half day fishing excursion will leave upon the best seasonal and weather conditions to provide your best chance of success. You will only need to bring yourself and a spirit for the outdoors onboard as rods and reels, tackle, bait, fuel, ice and drinks will be provided. We can even provide additional beverages such as beer for your trip upon request. Additional fishing excursions are also available upon request if so desired. If you decide to make the ultimate all day fishing experience, nearshore reef fishing trips are also available. These all day excursions to the Gulf of Mexico for a mixed bag of everything from giant bull redfish to red snapper can also be included in an all-inclusive stay at Louisiana Fishing Charters. Whether it is a family getaway, a corporate retreat, or just a desire to experience the best fishing experience Louisiana has to offer with your best friends, we can make it happen.